Whatever medications your clinic provides can interact badly with other substances including street drugs, so we suggest you avoid self-medicating on the day of your abortion. For your safety, please be honest about what you have taken. If you are on a prescription medication that you take daily for pain or anxiety, please let your abortion provider know. But drugs aren’t the only answer to pain. In one study of several different drug combinations, women who reported feeling relaxed and confident before their abortion also reported less pain regardless of what drugs they received. 1. Make the best decision for your life. It helps to feel confident about your decision. 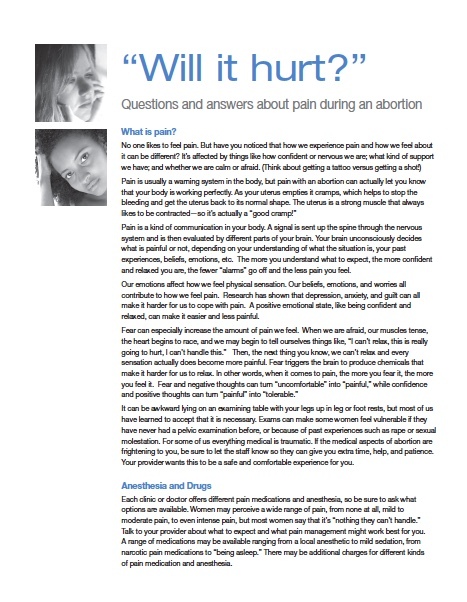 If you are unsure, take more time and get help from clinic staff or at the Pregnancy Options Workbook, before abortion downloadable audio abortion counseling, or call Backline (see below). Believe in yourself and your ability to make a good decision about your pregnancy. 2. Get support. Talk to people who will support and encourage you. Ignore people who will try to shame you or make you feel bad about yourself. Try to choose someone who understands what you are going through to come with you to the appointment. 3. You don't deserve to be in pain. The situation that brings you here is often complicated and can make you feel bad. Remember that you are a good woman doing the best you can in a tough situation. Be kind to yourself. 5. Relax. If you know any relaxation techniques, such as meditation, visualization, or controlled breathing, practice them before your appointment. Reiki or “healing touch” can also be helpful. Be ready to use these tools to help yourself cope during your abortion procedure. Slow breathing is easy to learn today. Inhale to the count of 4 and exhale to the count of 4; do this several times until you feel your muscles relax. 6. Distract yourself. Sometimes a distraction, such as talking or even imagining you are somewhere else can help. Generally, the support staff at the clinic are good at helping you focus on something else. 7. Smell something nice. Studies have shown that pleasant smells (lavender can be a mild mood enhancer) can help to reduce the perception of pain, especially for women. Talk to the staff about putting drop of a favorite fragrance on a cotton ball and breathing in the scent during the procedure.